You can have your ad here! Click here for complete information on the most economical way to reach tens of thousands of Northeast radio and TV people each week. *Even leaving aside the thrilling conclusion of the Red Sox' regular season (on to Chicago! ), it's been a most interesting week in eastern MASSACHUSETTS radio. A few days later, down the hall at sports giant WEEI (850 Boston), came word that longtime night host Ted Sarandis was, er, "leaving to pursue other interests." Sarandis joined WEEI in 1992, not long after the station's shift to sports, and his "Ted Nation" show had been a 7-midnight fixture there even as much of the rest of WEEI's schedule shifted. There's no word yet on a permanent replacement, or on what Sarandis will do next. He'll remain the voice of Boston College basketball, and it's not hard to imagine that he'll be talking to the new "ESPN Boston" (WAMG 890 Dedham/WLLH 1400 Lowell), too. Our best wishes for a speedy recovery go out to WBZ (1030 Boston) morning institution Gary LaPierre, who underwent triple-bypass surgery last week after suffering a heart attack. He's recovering and resting at his North Shore home, and we hope he's back in the anchor chair soon. Elsewhere in the Infinity cluster, WODS (103.3 Boston) is spinning its afternoon drive chair, sending J.J. Wright to overnights as it brings in market veteran Karen Blake (WJMN, WQSX, etc.). Meanwhile, WBMX (98.5 Boston) overnighter Dan O'Brien moves over to WBCN (104.1 Boston) to serve as music director, replacing Steven Strick, who's taken a new job with Radio & Records magazine. And we've been terribly remiss in failing to note that the FCC approved the move of WFNX (101.7 Lynn) from its current site in Medford to the One Financial Center tower in Boston a few weeks ago. Construction's now underway at One Financial Center, and we look forward to bringing you pictures soon. Speaking of signal upgrades, Costa-Eagle's WNNW (800 Lawrence) is applying to triple its daytime power. The proposed upgrade from 1 kW to 3 kW at the station's current site in Andover won't give WNNW the Boston signal Pat Costa has said he wants (the poor ground conductivity between Andover and Boston is the issue here; ironically, it's that same poor conductivity that makes it possible for a higher-powered WNNW to coexist with Providence's WSKO on 790), but it should at least improve WNNW's signal up and down the Merrimack Valley. WNNW will remain at 244 watts after dark. *A well-known morning show is returning to the airwaves in NEW HAMPSHIRE's Lakes Region. Allan Harrison's "Lakes Region Newsday" used to be on WEMJ (1490 Laconia) until an ownership change there displaced it; now the show's moving to WEZS (1350 Laconia), where Harrison will lease the 6-9 AM slot on weekdays for the broadcast. Clear Channel's WHEB (100.3 Portsmouth) and WGIR-FM (101.1 Manchester) are getting a new evening show. 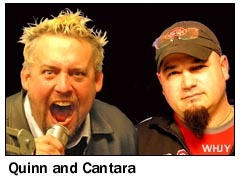 Sister station WHJY (94.1) in Providence, RHODE ISLAND will turn its "Quinn and Cantara Show" into a network broadcast that will also be heard on the New Hampshire rockers from 7-midnight weeknights. *From CONNECTICUT comes word that a well-known morning voice has been silent. Ron Rohmer came to the New Haven area from his native Canada to play hockey in the fifties, but moved into radio at WELI (960 New Haven) in 1961. He became the city's most popular radio personality during his long run in morning drive there, but an ownership change in 1995 pushed him out of the slot. Rohmer sued Clear Channel for age discrimination, and the company soon brought him back at sister station WAVZ (1300), from which he retired in 1999. Rohmer died last Sunday (Sept. 25); he was 74. 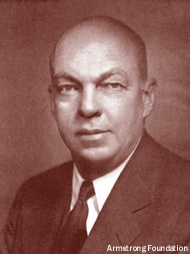 *The memory of legendary inventor Edwin Howard Armstrong will be saluted again next weekend in NEW YORK at the Audio Engineering Society's annual convention, which gets underway Friday at the Javits Convention Center. The Armstrong commemoration will take place Sunday (Oct. 9) from 5:30-7:30 PM, reuniting the panelists who discussed Armstrong's life and legacy in June at his historic tower in Alpine, N.J. This panel will give the group (including Armstrong's colleagues Henry Dietz, Gil Houck and Ren McMann, his nephew Bob Brecht, his lawyer Jerry Minter, tower owner Chuck Sackermann, replica transmitter builder Steve Hemphill and historian Mike Katzdorn) more time to reflect on Armstrong's contributions to the radio industry - and, oh yes, it will be moderated by yours truly, in my capacity as a contributing writer for Radio World. And as exciting as the Armstrong panel will be, it's only one of the historic events AES will be offering. On Friday afternoon, Himan Brown, the creator of the CBS Mystery Theater, will be staging a recording of a brand-new radio drama called "Rockets Red Glare." While we're in New York, we'll be checking out that new tower for WFUV (90.7) - and perhaps also WFUV's new studios. 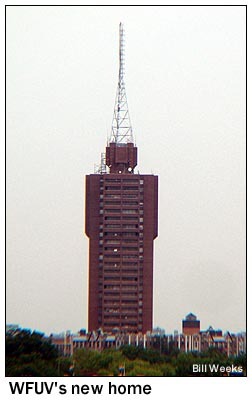 While the attention last week was focused on the new tower that went up on a Gun Hill Road apartment building, WFUV was also moving out of its longtime home on the top floor of Fordham University's Keating Hall and into a new studio complex in the building's basement. We'll also be listening for WNYH (740 Huntington), which fired up again last week after several months of silence. The former WGSM has been testing with gospel music, on and off. We'll look for WNET-DT (Channel 61), which is reportedly just about to fire up its full-power service from the Empire State Building. WNET had just finished building its DTV installation at the World Trade Center when the buildings were destroyed four years ago; since then, it's been operating at flea power from the roof of the station's studio building at 450 W. 33rd St.
And we'll be sure to stop by and congratulate John Lyons, who's just been promoted to assistant VP/Director of Broadcast/Communications for the Durst Organization, which owns the Four Times Square tower site that he's worked so hard to build into an impressive auxiliary facility for many of the city's broadcasters. Upstate, Holy Family's WHIC (1460 Rochester) has filed an application to leave the three-tower site in Brighton that's been the station's home since 1947. (It was WHEC back then.) The station's losing its lease on the site, but it's found a new location a mile or so to the west at the four-tower site of Entercom's WROC (950). WHIC would use the three in-line towers at that site, running 4500 watts non-directional from the center tower by day and 3000 watts directional at night, more or less replicating its current 5 kW DA-N signal from its existing site. Kevin Legrett's been promoted to regional president at Citadel, with responsibility for the company's stations in Buffalo, Syracuse, Binghamton and Erie, Pennsylvania. *A format change on the NEW JERSEY shore: WADB (1310 Asbury Park) flipped from standards to country early last week. *Today's launch day for PENNSYLVANIA's newest sports station. WPEN (950 Philadelphia) said goodbye to its oldies format, with Jim Nettleton as the last live jock Friday night, and today it enters the battle against entrenched market leader WIP (610). In Scranton, the "Chet" stunt at WWRR (104.9) came to an end on Monday, when the station relaunched as "105 the River." At least in its initial days - it's kicking things off with a 5,000-song "River Cruise" - the station's music mix seems like the "variety hits" formats known elsewhere as "Jack," "Ben," "Mike," and so on. GM Bob VanDerheyden tells the local papers that the River won't have the same attitude as the "Jack" clones, though, and he prefers to think of it as an AC with a particularly broad playlist. Is a format change coming to the Lehigh Valley? Nassau has applied to change the calls of WYNS (1160 Lehighton) to WBYN, which leads us to think that the station will be dropping its sports simulcast with WEEX (1230 Easton) and WTKZ (1320 Allentown) in favor of a simulcast with religious WBYN-FM (107.5 Boyertown). Could a sale be next? On the other side of the state, WZUM (1590 Carnegie) changes hands from Horvath Broadcasting to Starboard Communications. Starboard had been LMA'ing the station for its "Relevant Radio" Catholic programming, so no changes will be evident for Pittsburgh listeners. And we note the passing of former station owner Nelson Goldberg. Goldberg, who died last Sunday (Sept. 25) at age 76, owned WKPA (1150 New Kensington, now WGBN) and WYDD (104.7 Pittsburgh, now WPGB). *In CANADA, we're just over a week away from the launch of Rogers' new news outlets in the Maritimes. "News 95.7" (CJNI Halifax), "News 88.9" (CHNI Saint John) and "News 91.9" (CKNI Moncton) will sign on October 11, with similar news wheels to Rogers' "680 News" in Toronto and "News 1130" in Vancouver. In Toronto, Rogers has pulled the jocks from its "Jack FM" (CJAQ 92.5), and the station's running with just liners, listener phone calls and music for now, fueling rumors of a possible format change. Over in Hamilton, CIWV (Wave 94.7) wants to increase its power from 11.3 kW to 45 kW, with a directional antenna at 136 meters above average terrain. And in Wingham, Blackburn's CIBU (94.5) has been granted an increase in power from 21.2 kW to 70.14 kW, dropping its antenna to a lower height. The Boston Bruins continue on WBZ (1030) and NESN, with Jack Edwards replacing Dave Shea on play-by-play duty for road games. The New York Rangers are now on WEPN (1050), with some conflicts moving to WABC (770) when the Knicks are also playing. TV, of course, is co-owned MSG Network. The New York Islanders are on WBBR (1130) and Fox Sports New York. The New Jersey Devils return to action with a new flagship, WFAN (660); some games that conflict with WFAN's Nets broadcasts will be moved, probably to WQEW (1560). The Buffalo Sabres have new radio and TV homes, since their old ones (WNSA 107.7 and Empire Sports Network) disappeared as part of the bankruptcy of former team owner Adelphia. Radio coverage moves to WGR (550), while most games will be seen on a regional split of the MSG Network in western and central New York. The Philadelphia Flyers continue on WIP (610) and Comcast Sportsnet; ten games get broadcast coverage on WPSG (Channel 57), and there will be a few conflicts with WIP's 76ers broadcasts that will likely end up on WPHT (1210). The Pittsburgh Penguins are on WBGG (970) and WWSW (94.5), with TV coverage on Fox Sports Pittsburgh and six Saturday night games on WNPA (Channel 19). The Toronto Maple Leafs continue on CFMJ (640), with TV rights divided among the CBC, Rogers Sportsnet, TSN and the team's own Leafs TV network. The Ottawa Senators will be heard on CFGO (Team 1200), with TV rights divided among the CBC, "A Channel" CHRO-TV, Rogers Sportsnet and TSN. Some games will also be seen in French on RDS. The Montreal Canadiens are on CJAD 800 in English and CKAC 730 in French (and Joseph notes that the schedule posted on CJAD's website includes a Stanley Cup parade June 20! ); there are no full-season TV deals, but RDS has about half the games in French, while TSN and the CBC share English-language coverage. That's it for another week - see you back here on Monday! *Tower Site Calendar 2006 is just back from the printer, and we've got to say, we're especially proud of the way this one turned out. Once again, we bring you more than a dozen images from the fybush.com collection that have never seen print before, including that nifty nighttime view of New York's WMCA that graces the cover. You also get to see WSB, KTAR, Mount Wilson, CBV and many, many more, plus all those fun dates in radio and TV history, civil and religious holidays, a handy full-page 2007 calendar, and the always-popular hole for hanging. And we do it all with no increase in price, for the fourth year running! The calendars are shipping now, so there's no need to wait until the holidays to enjoy all that tall steel and all that broadcast history. Order now and beat the rush! You can get one free with your 2006 subscription to NERW at the $60 level, or order the calendar (plus other goodies) at our brand new fybush.com Store! We think you'll like this one - and as always, we thank you for your support.